A legend says that there was once a warm sunny day in Scotland. I have started my quest to find out if the myth was true, but I was not the only one. A group of scientists from the UK Met Office and EPCC have developed a very precise weather model to test out all possible outcomes. Being like the scientists they are, their model produces lots of human-unreadable, scientific data describing the atmosphere through a period of time. In order to let the general public have a glimpse of what the scientists are doing, I will try to develop a visualization of it, so that the search for that sunny day may continue. And so we come to the other aspect of the project, outreach. Outreach is a vital part of science; it is important for the public to follow the scientific community and the progress it makes. Scientists need to engage with the public and share their knowledge with them, so that anti-reason things like anti-vaccine and anti-GMO don’t happen. The modern way of doing science is of course, to use high performance computing. It is also a advantage if we could show the impact HPC and science have in the lives of “ordinairy” people, whether they realize it or not. Weather forecasting is the right choice to do outreach with, since it is a common and very important application of HPC, but at the same time, the general public is familiar with its concepts and uses it daily. Here you can see a visualisation I have been working on using the data from MONC. The blue dots are vapor; you can see the clouds forming above the vapor. EPCC has in conjunction with the UK Met Office developed a new, state of the art, weather forecasting model called MONC, which the scientific community are now starting to use. That model is capable of very high resolution (~10 to 50 m) modelling of clouds, precipitation and cloud feedbacks, it is one of the tools that is used very effectively to further our understanding of the interactions of aerosol, clouds and radiation processes. Also, there is Wee Archie, a small supercomputer made out of Raspberry Pi’s, that reassembles ARCHER, the main UK supercomputer. Wee Archie is used at outreach events, it gives the general public a better understanding of such machines, how they are build and how they operate. Well, it would be great if we could somehow combine all these things, wouldn’t it? That’s what I will try to do. We’ll have a few components playing the part. I’ll explain the general idea how the outreach will be done. At public events, visitors will be able to set up their own weather simulation, choosing parameters such as atmospheric pressure, temperature and wind and run the simulation. 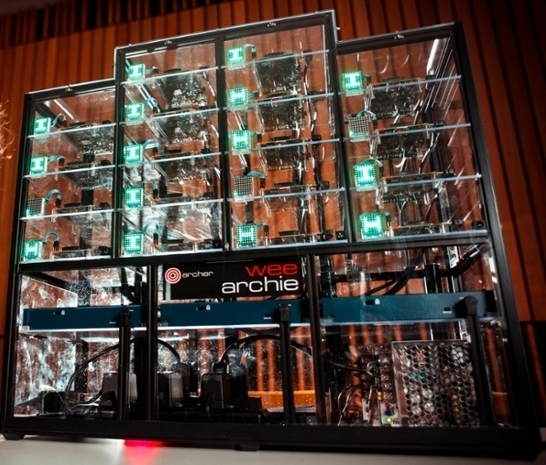 The configuration is sent to a supercomputer to run the simulation, in this case Wee Archie. Wee Archie then calculates how the different parts of the atmosphere react to each other and gives us data descriptions in each timestep. Each timestep is then visualized in real time, while Wee Archie is working hard on delivering us the next atmosphere state. There will also be a challenge for the users, which always makes things fun; to try and make it rain as much as possible. ‹ Python, MPI, CFD and ARCHER – what is a bigger challenge?